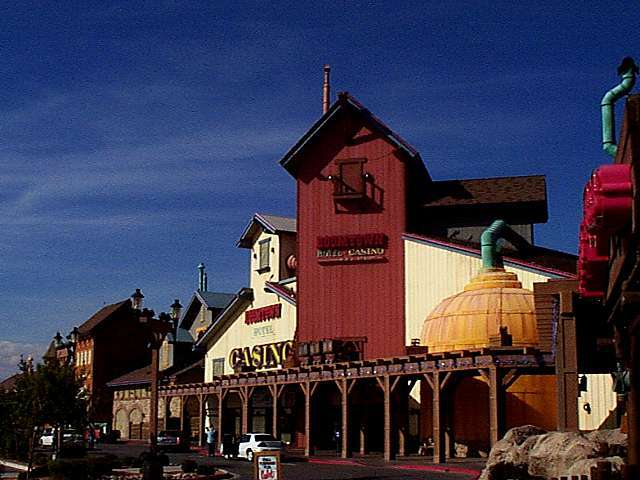 Nevada's gaming industry doesn't take any chances; the first casinos straddle the state line on the main (only?) highway from Southern California to Las Vegas. (What did they think: that we'd turn around and head back into California?) At first there were two: the Primadonna for people heading north and Whiskey Pete's for those heading south. (I guess Primadonna is a pun on the Primm Valley where they're located. And what's with Whiskey Pete's? A castle motif? Isn't that mixing metaphors?) Now there's a third one called Buffalo Bill's, home to the most vicious rollercoaster I've ever had the misfortune to ride. My comment to another rider: "I can see my breakfast from up here!" 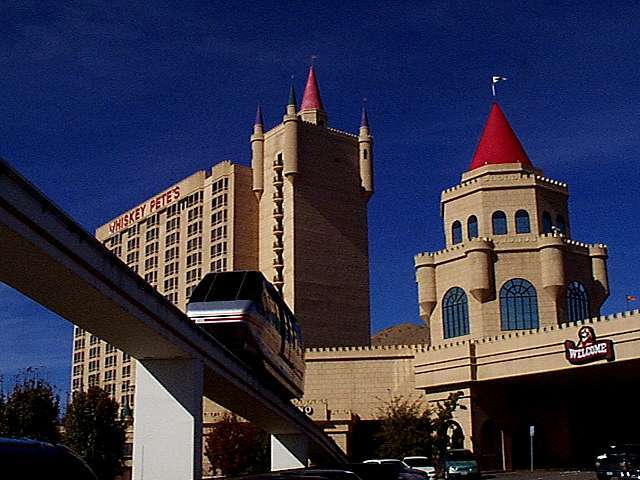 You have to travel almost thirty miles before your next chance to gamble. Nevada Landing which claims to be in the town of Jean, although if there's a town, I certainly didn't see it. There's something surreal about a giant riverboat surrounded by scrub and hills. But it sets the tone nicely for what's to come. We aren't talking major supplies of subtlety here. 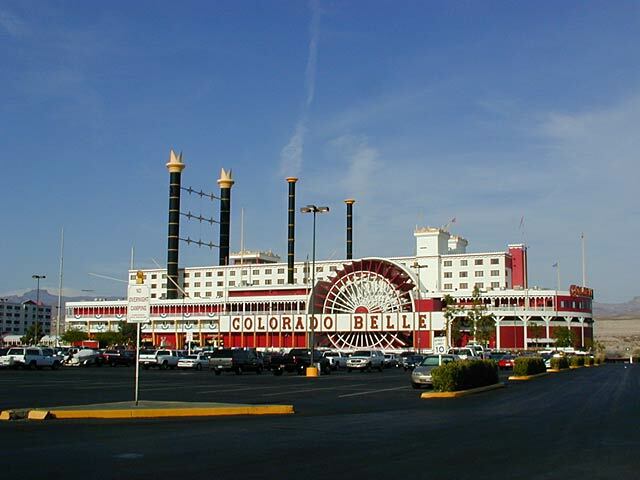 To be fair, not all the hotel designs are quite so anachronistic: a few like the Boomtown actually seem to belong to their surroundings. There's something awfully refreshing about that. 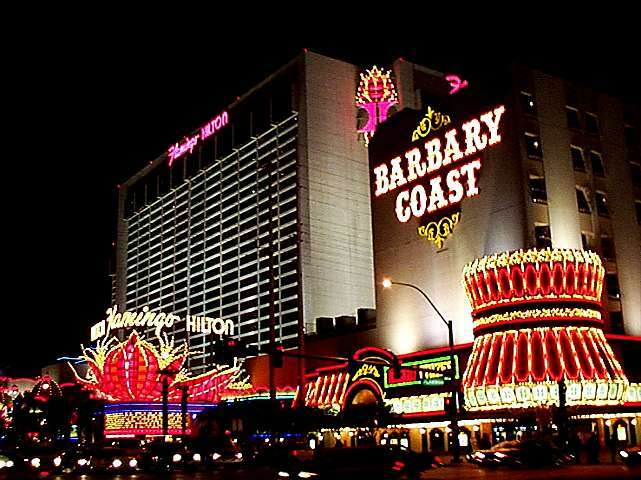 When I first started visiting Las Vegas the hotels mostly looked like hotels anywhere else, at least if you ignored their size and the infinitude of lights. Things have changed in recent years. Now the entertainment begins before you get in the door. 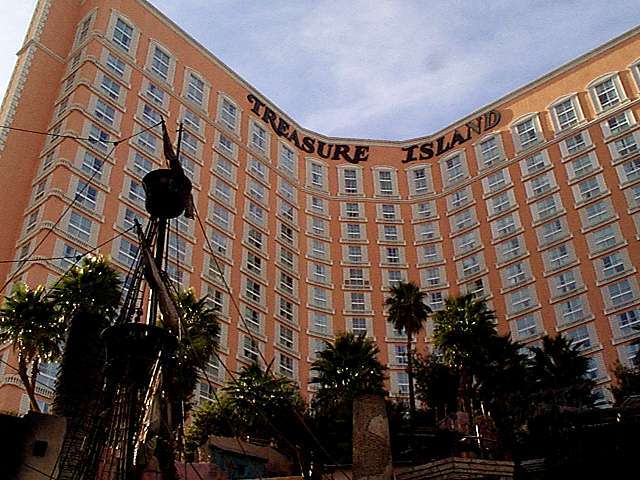 Treasure Island is a case in point: every ninety minutes the hotel stages a battle between a British frigate and a pirate brig. This being Vegas the pirates get to win! In fact, they send the Brits to Davey Jones' locker. That can't be good for the crew's self image! 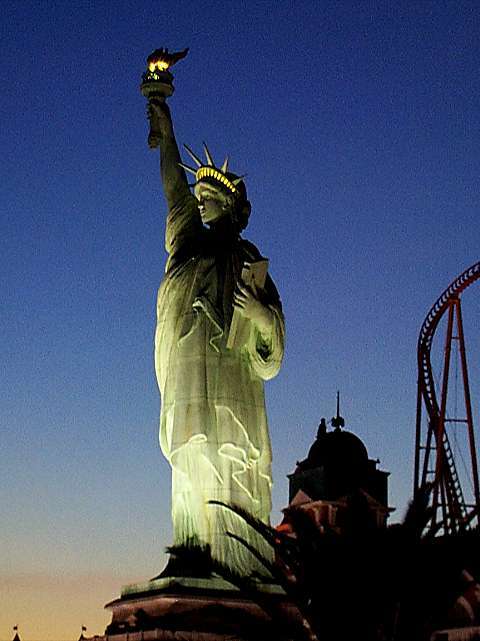 New York, New York is probably my favorite and certainly the most elaborate of the hotels on the Strip. The exterior is a collection of Manhattan's major landmarks, looking better than they do in real life. 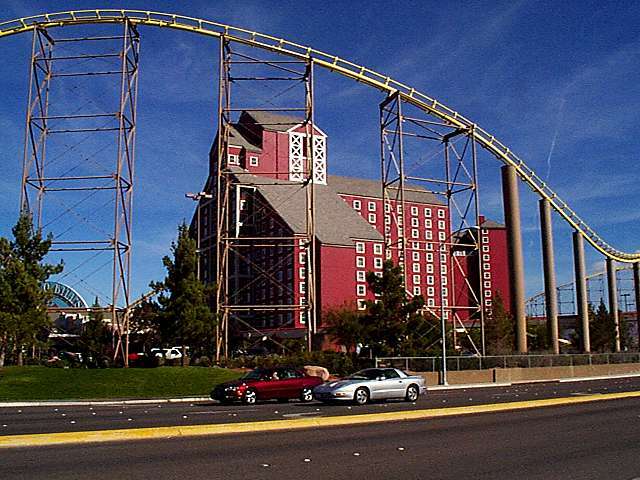 (The addition of a rollercoaster that winds around the buildings doesn't hurt either.) Inside the bars and restaurants attempt to reproduce New York streets, although without the dirt, crime and other elements that would lend versimilitude. (There's such a thing as being too realistic.) 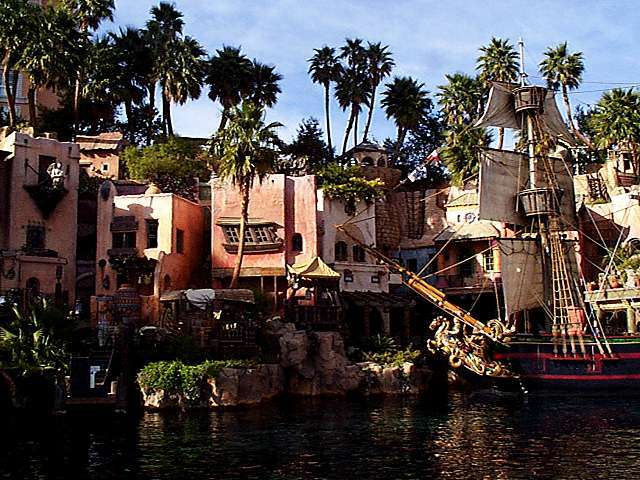 The place is quite an accomplishment, all the more after my encounter with EuroDisney's version a month earlier. 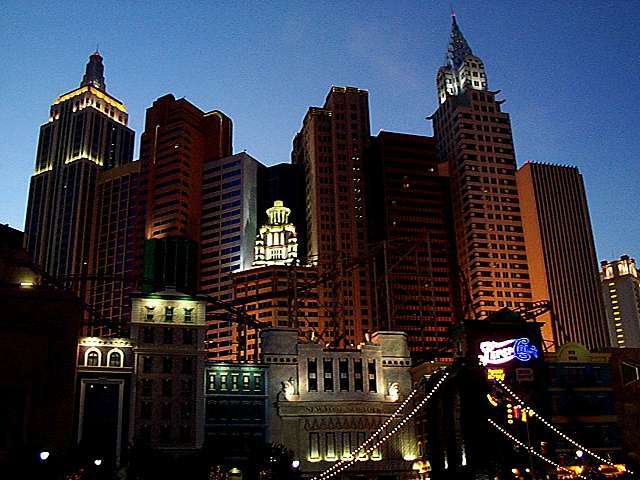 Las Vegas at night has to be seen to be appreciated. 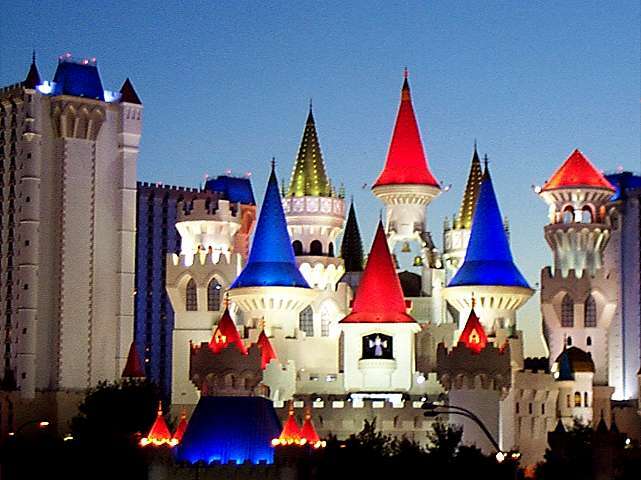 The more modern hotels like Excalibur miss out by just lighting up the same impressive structures we see by day. It's the older hotels that have the right idea: millions of sequencing lights creating a kind of sensory overload. It's a good thing that they provide good, thick curtains in the rooms in the city that never sleeps. Otherwise I wouldn't either. Surrounded by so much excess, I guess everyone has to shout to get a little attention. 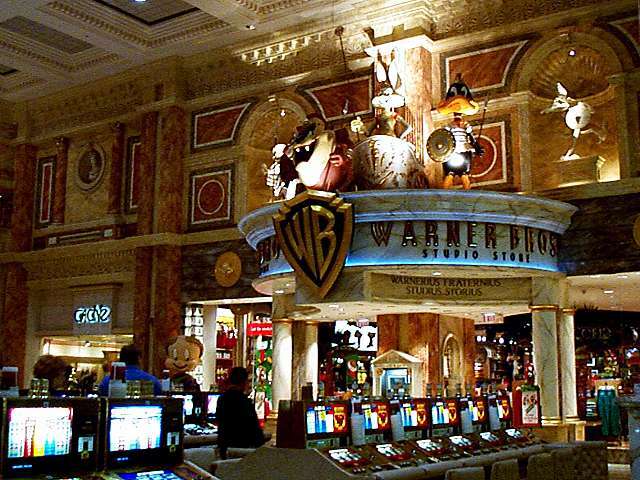 Caesar's Palace has the best looking Warner Brothers store I've ever seen. (Fortunately no one noticed me taking a picture in the casino. They frown on that sort of thing. Forcefully.) 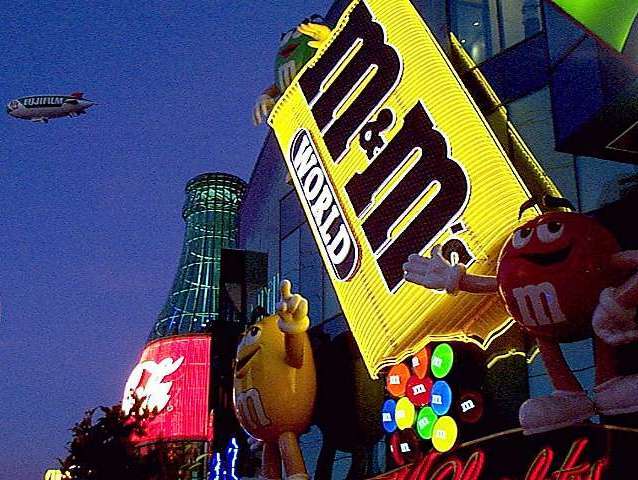 And then there's M&M's World: four floors of chocolate excess shared with Ethel M Chocolates. Trust me: the storefront is the best part. 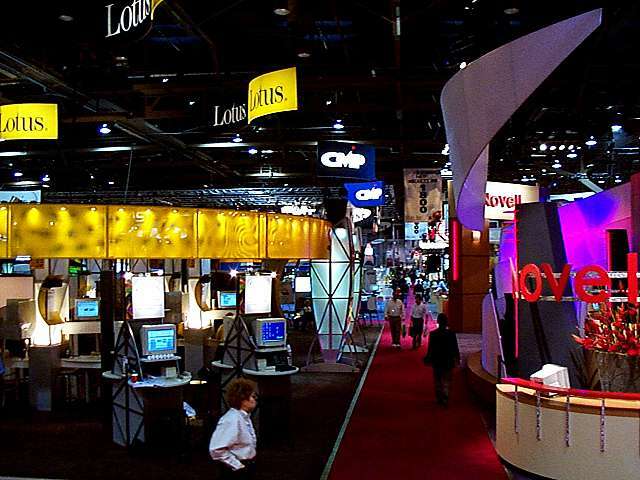 For those of you who haven't been to Comdex, imagine a computer show you have seen and multiply by a factor of five or more. (Attendees of CeBit in Hannover should divide by three.) Lucky for me that my exhibitor badge gets me into the hall before the rabble. Those few moments before the crush of humanity arrives are the last bits of calm I'll experience until I crawl back to my room at night. And to think I used to do this for fun! In a year where technical innovation was in short supply, exhibitors get increasingly elaborate (desperate?) in their presentations. Movies, magic acts, dancers, showgirls, giveaways, parties: everyone tries their hardest for a little attention. By the third day the booth presentations are pretty well attended, if only because people are glad of a chance to rest their feet. It seems so appropriate that Dilbert has become an unofficial mascot to the show. 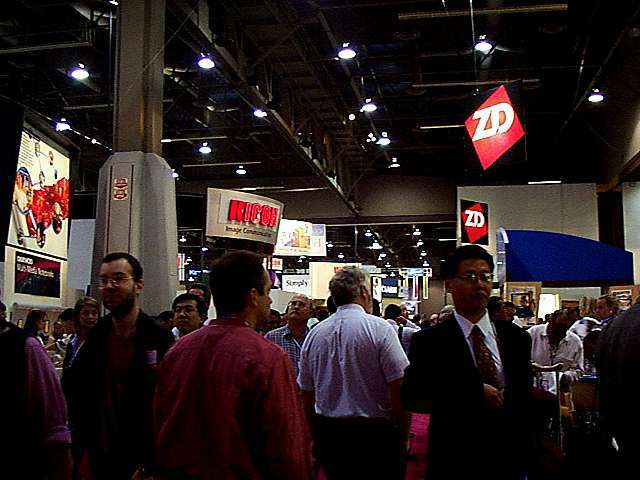 (Actually, the official mascot: the Comdex show's store had a line of official Dilbert shirts with the Comdex logo on the sleeve.) 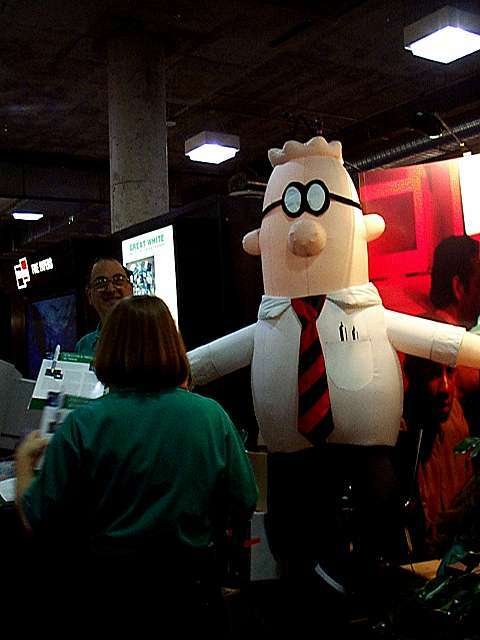 But what does it say about this consulting firm that puts a giant inflated Dilbert in its booth? I'm not much of a gambler; eventually, the sight of all those slot machines starts to get to me. 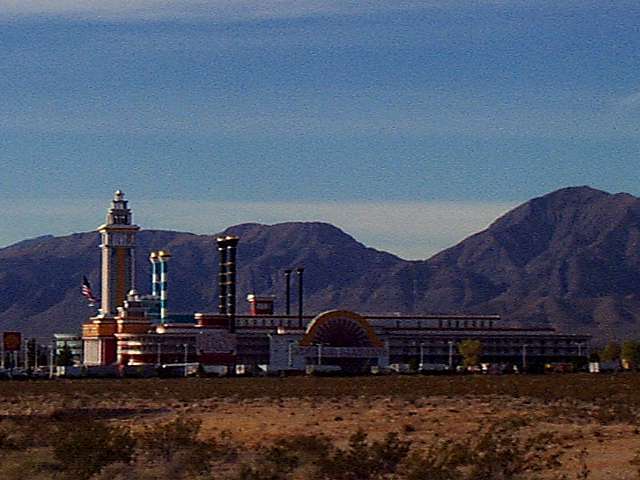 Boulder City, an hour's drive down the road from Vegas, has the honor of being the only town in Nevada where gambling is illegal. 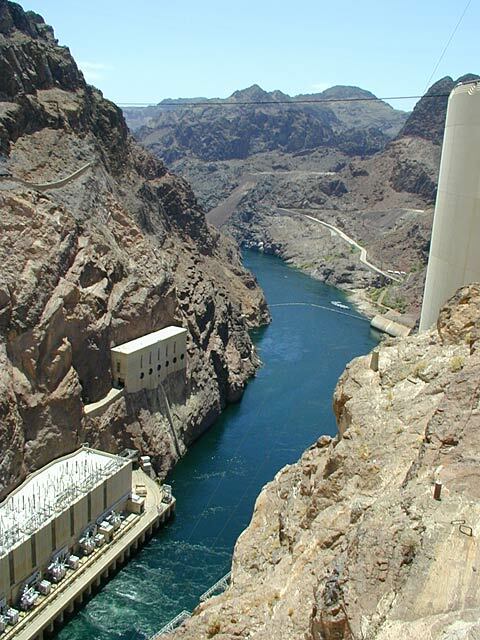 That goes back to the thirties and the construction of Hoover Dam on the Colorado River. (Even in those days, Federal funds came with strings attached.) 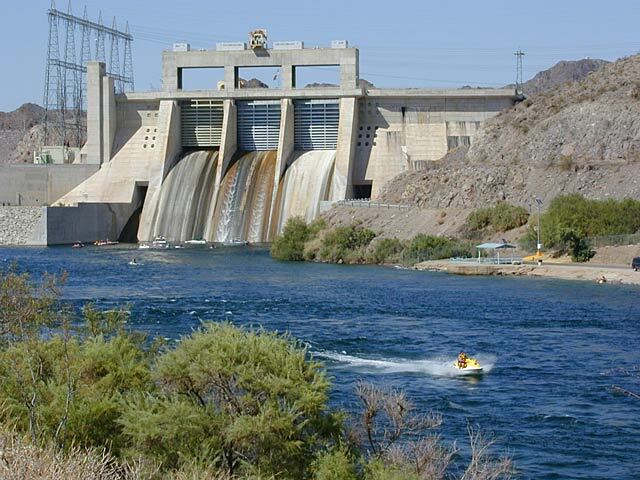 The dam is a remarkable achievement that came in ahead of schedule and under budget. One hundred fifty million dollars? Hell, that's one medium size dot-com IPO! The original purpose of the dam was to reduce the ruinous effects of flooding. Late in the process someone had the thought that all that rushing water might be turned to some purpose. 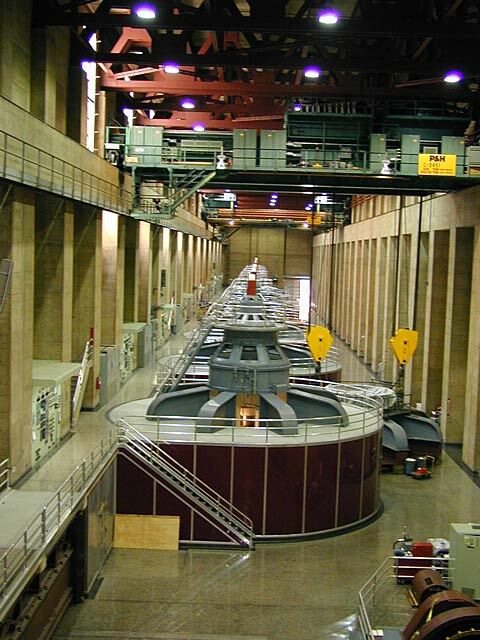 The result were these huge hydroelectric generators, each capable of providing the electric needs of a community of 100,000 people. (Is this community pre- or post-Internet?) Impressive stuff, especially for those of us more familiar with science and engineering on a microscopic scale. 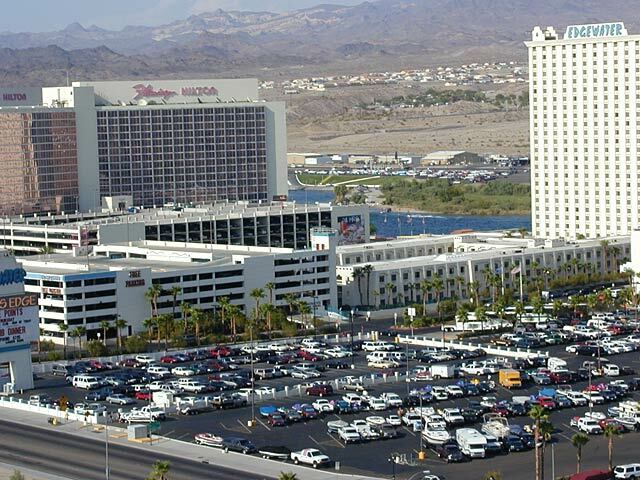 You have to be a hardy soul to leave the air conditioned comfort of the casinos during the day, at least when I was there in mid-July. But people do, braving 115 degree temperatures to sit by the river or race up and down on jetskis. 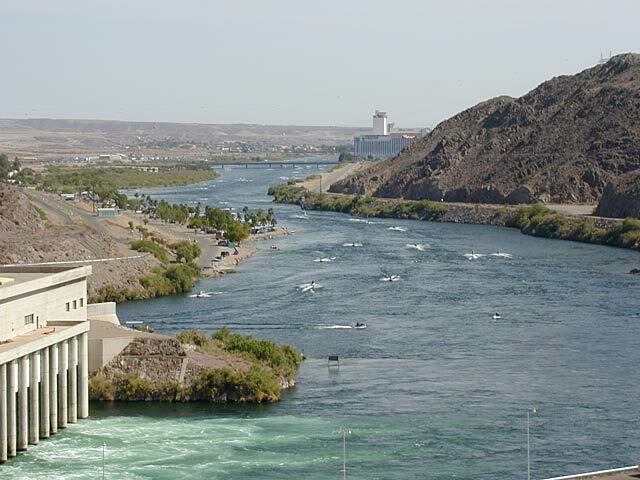 A dam just north of town separates boaters above from the jetskiers below, as well as keeping the Colorado from washing the whole mess down to Mexico. That would be a terrible thing. Wouldn't it? Florida's palmetto bugs, certainly a benign name for giant flying cockroaches.